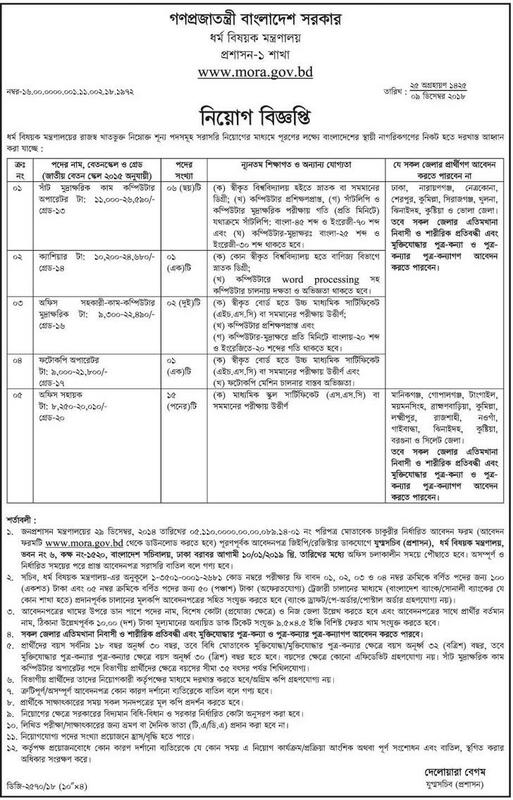 Thank you for your interest in employment with the Ministry of Religious Affairs job circular 2018 in Bangladeshi government sector.In January 25, 1980 Ministry of Religious Affairs started as a separate Ministry of the Government of the People’s Republic of Bangladesh.We sure that you will find the better job information provided below. Ministry of Religious Affairs has circulated job circular in recent times.This is your chance to share your story and connect with job field in our country. As a hoping for a job, you’ll represent your skill and qualification. Please note that resumes/cv send only not direct interview or other communication. Since the start of operations in 1980 as an independent Ministry, Ministry of Religious Affairs is performing all kinds of Religious Affairs Activities of the Government by the offices and organizations under the Ministry named Islamic Foundation, Office of the Waqf Administrator, Haj Office Dhaka, Haj Office Jeddah/Makkah, Hindu Religious Welfare Trust, Buddhist Religious Welfare Trust, Christian Religious Welfare Trust and various branches of the Ministry.The main objective of the Ministry is to improve the religious affairs. It works to contribute in the national development through human resource development and working in encouragement of brotherhood, values, religious belief in both national and international level. After the independence of Bangladesh, Religious Affairs activities started under Ministry of Education. Then, the Ministry was under the Ministry of Sports, Culture and Religion. In January 25, 1980 Ministry of Religious Affairs started as a separate Ministry of the Government of the People’s Republic of Bangladesh. It was renamed as Ministry of Religious Affairs and Endowment on March 8, 1984. Later on In January 14, 1985 the name changed again and renamed as Ministry of Religious Affairs.